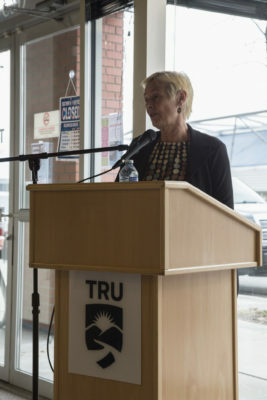 As part of the first Access to Justice Week, Julie Macfarlane, a professor at the University of Windsor, spoke on the ever-changing climate of self-represented litigants and how her project, the National Self-Represented Litigants Project (NSRLP), is working towards understanding the needs, motivations and challenges of self-represented litigants (SRLs). The project builds upon a research study conducted from 2011-2013, analyzing the experience and demographics of SRLs in three provinces, Alberta, British Columbia and Ontario. The study found that in urban family courts in cities like Toronto, Vancouver and Calgary, SRLs are approaching 80 per cent of total litigants at an alarming rate. More of her findings can be found in her book, The New Lawyer. According to Macfarlane, much of this phenomenon can be traced back to a complex affordability puzzle composed of legal costs, insufficient resources, the perceived value of legal services and the self-help culture. Macfarlane mentions the generational shift in how people use their money and the proportional increase in disillusionment with traditional legal services. As a result, the public is turning to online resources for their legal needs. Macfarlane noticed that more clients want lawyers to be more collaborative with them instead of instructing them. “The thing that people, in particular, were starting to tell me was that they were very disillusioned with the idea that the lawyer would tell them what to do and wouldn’t listen to them,” she said. With the vast amount of information found on the internet often unreliable, Macfarlane agrees that there needs to be some trusted intermediary for self-represented litigants to ensure at least some degree of source quality. In a changing environment of stepping away from the classic full representation model and into new legal models, it will depend on the lawyer to view this change as an opportunity or threat to their profession. Access to Justice Week is an event series dedicated to raising awareness for access to justice issues in the profession and highlighting what is being done to address them. It featured guest speakers, panel discussions and legal clinic sessions for law students and practitioners. The three BC universities hosting the events also held a hackathon event known as JusticeHackBC, where software developers competed to create solutions for barriers around family law issues.